On July 31st 2015 the enclaves that formed one of the world's most complicated borders were officially absorbed in to the countries that surrounded them in a land-mark land swap between India and Bangladesh. And the people that lived in them will finally receive citizenship in their chosen country. Enclaves, locally known in this region as chitmahals, are small pockets of sovereign land completely surrounded by another sovereign nation. Approximately 160 enclaves exist on either side of the India-Bangladesh border. For 68 years the 50,000 plus inhabitants of these enclaves have lived a difficult existence, stranded from their home nation and ignored by the country that surrounds them. In theory even leaving their enclaves was illegally crossing an international border and for decades it has been very difficult for them to receive even the most basic of rights whether education or health. Even the police have no jurisdiction in the enclaves leaving them essentially lawless. As of mid-2015 the people were allowed to choose. None of the Bangladeshi citizens of India's chitmahals chose to return to Bangladesh and so will become India citizens. 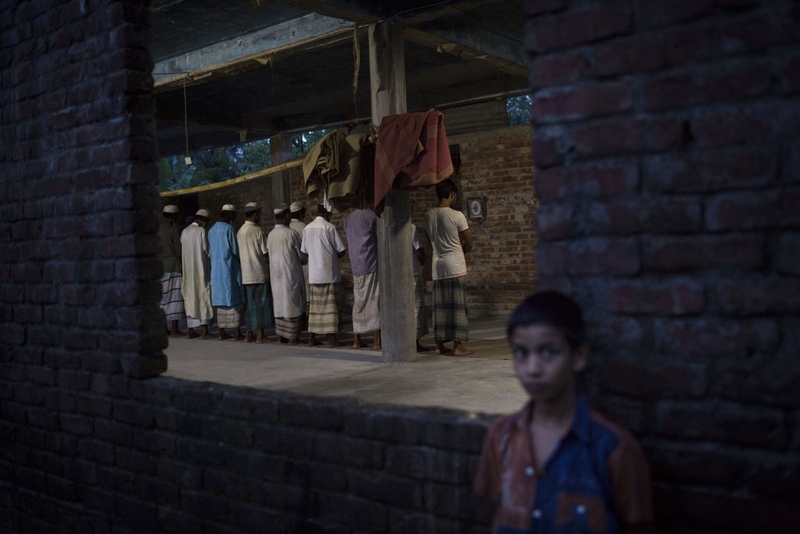 Yet nearly 1000 Indian residents of Bangladesh's enclaves chose to become Indian citizens and in the month's that followed that historic day they would re-locate their lives to start a new but unknown chapter. This documentary was shot in the last 'official' weeks of the chitmahals in Bangladesh before their complete dispansion and shows the harsh realities of the past yet the uncertainty of their future. 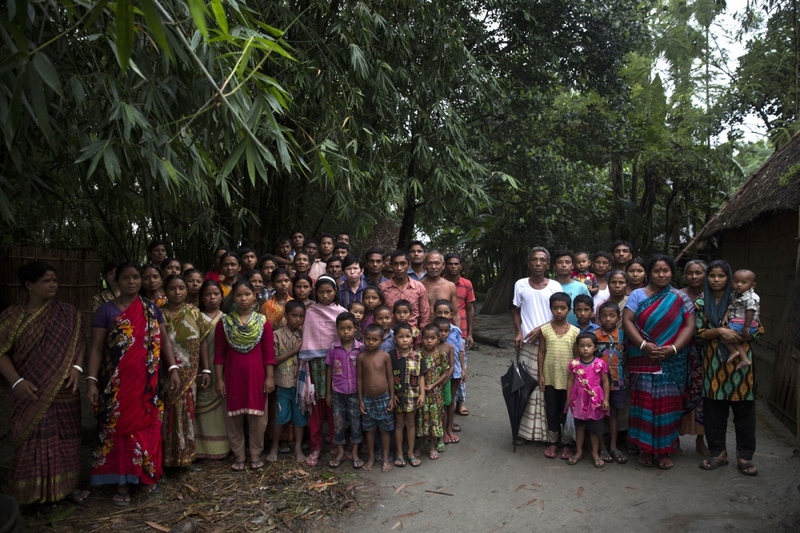 The inhabitants of Ponchoki Bhajini village located inside the enclave of Dhoholakhagrabari stands together showing who will move to India and who will stay. 20 out of the 22 households shown on the left, decided to become Indian citizen's and will move to India for ever later this year. The small group on the right represents those that originally decided to move to India but later changed their minds and will become Bangladeshi citizens. 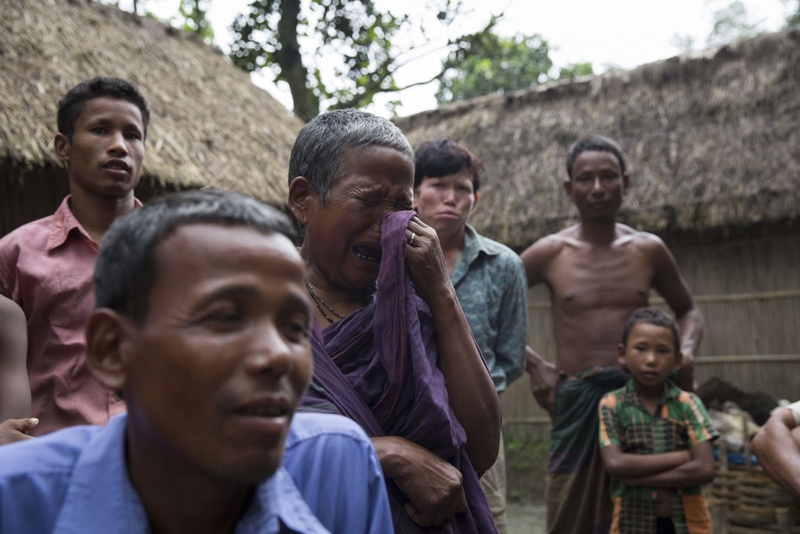 Dhonobala Rani, 70, gets emotional knowing that in a few months she will have to leave her son (front blue shirt) behind in Bangladesh when she takes Indian citizenship. Inside an enclave, or chitmahal, a man prepares jute removing the thread and keeping the sticks. For the many inhabitants of the enclaves, jute is where most of their income comes from and also what they use to build their houses. Jute is also known as the Golden Thread of Bangladesh is one of the largest industries in the country. 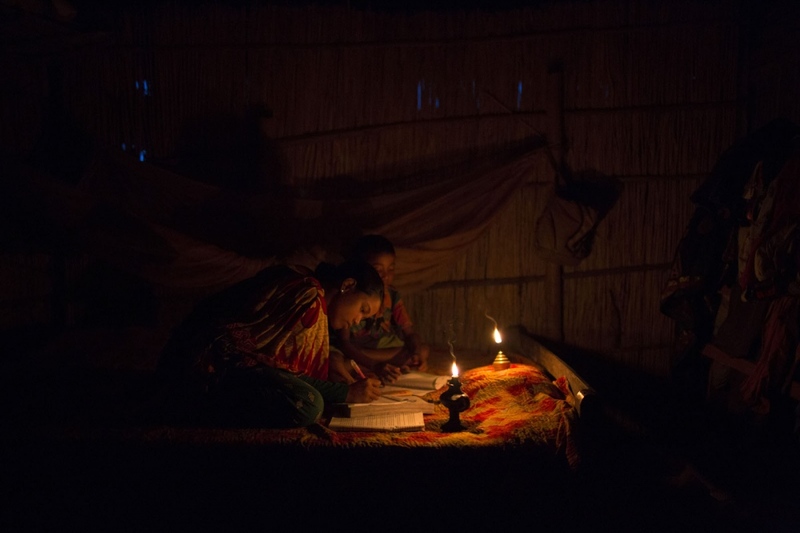 In a house located inside the enclave of Dhoholakhagrabari, Eity Rani, 14, and Shobo Rai, 8, do their homework by the light of an oil lamp. Life is much harder for children who were born in to enclaves. 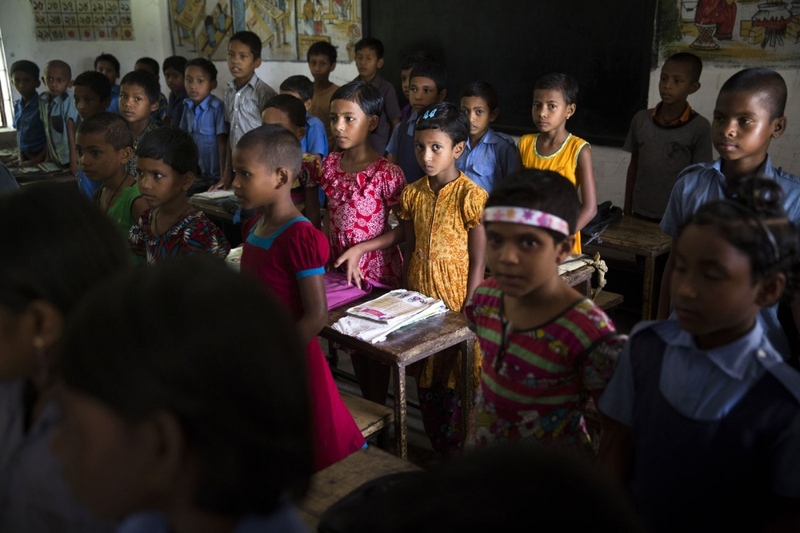 To go to school their parents must pay money under the table and receive a fake address. Then if they are successful the children must do their homework in the dark as no houses inside the enclaves have electricity. 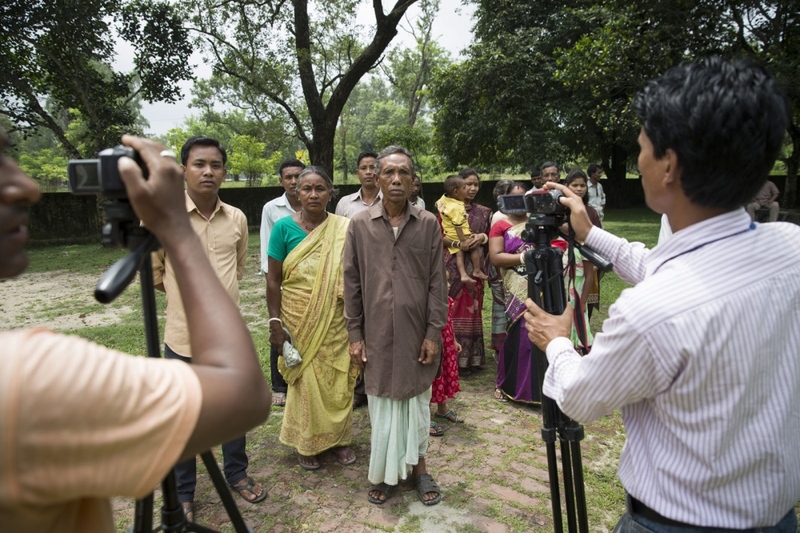 An extended family arrive at a government compound in the town of Debiganj to sign documents and filmed by local TV journalists. Originally they asked if they could go to India after the disbanding of the enclaves but later changed their mind and decided to stay. Their request was allowed and formalised on this day. Muslim men from the Dhoholakhagrabari enclave pray in their mosque. 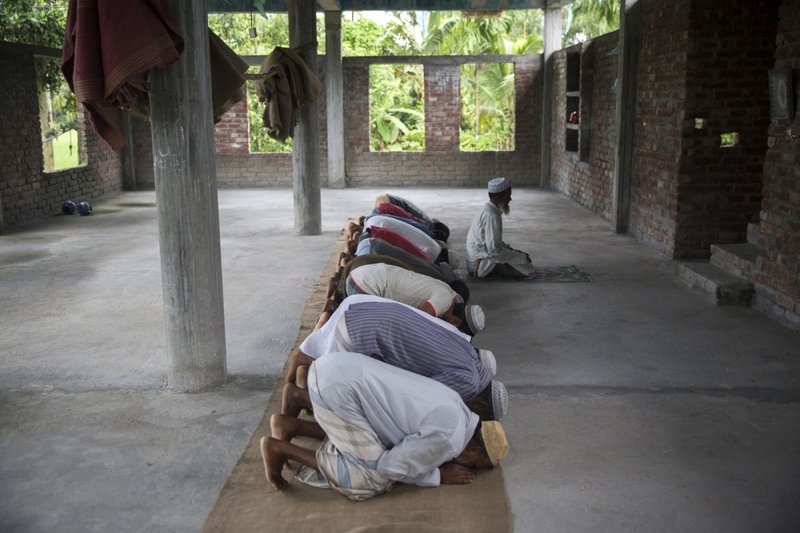 The only solid structures that exist inside the enclaves, that aren't made of jute sticks and bamboo, are mosques. People have not risked building solid structures for housing due to the uncertainty of their situation and lack of roads to bring in the heavy material. With no outside help the locals collected donations and built this unfinished structure to use as their place of pray. 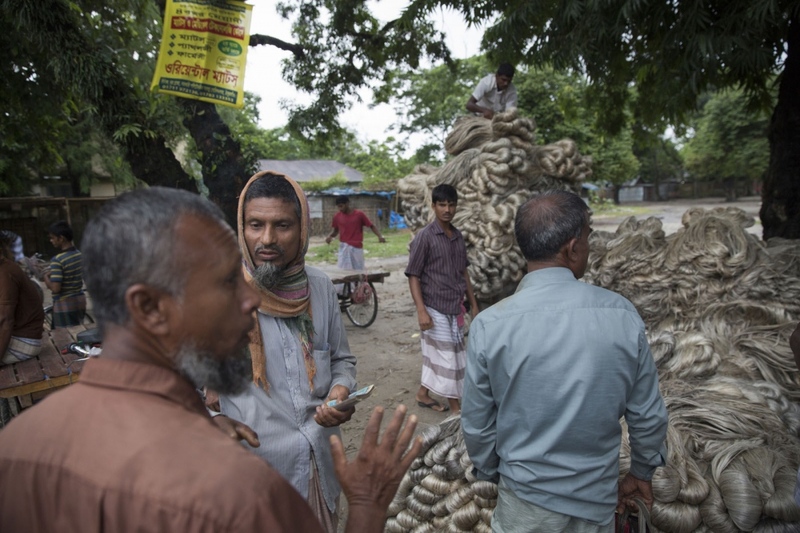 Every Saturday morning a large jute market is held in the main square of the town of Debiganj. From here the jute will be sold and transported to Dhaka. For the many inhabitants of the enclaves that surround the town, jute is where most of their income comes from and they will bring it here to sell. Jute is also known as the Golden Thread of Bangladesh is one of the largest industries in the country. Rupsana Begum, 7, (pink and white dress) and Monalisa Akter, 7, (orange dress) take part in the daily raising of the Bangladeshi flag at Sher-e-Bangla Government school. They are both from an enclave but were able to come and study as a result of their parents managing to acquire fake documents and pay money. 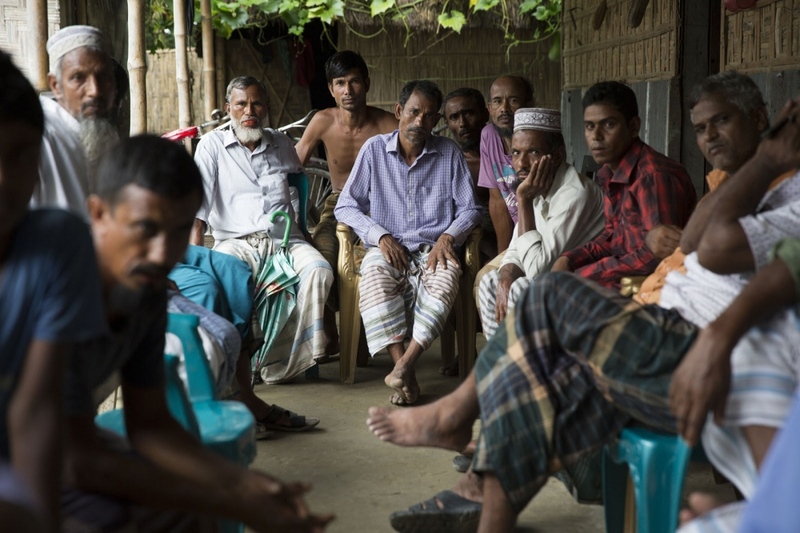 At Borezerdanga village in one of the enclaves near the town of Debiganj a meeting is being held between village elders and men known as 'peace keepers'. Here to discuss the issue of an underage marriage, until a few weeks ago when the enclaves were disbanded the Bangladeshi police had no jurisdiction inside the enclaves so residents relied on peace keepers to sort out problems ranging from illegal logging to land disputes. 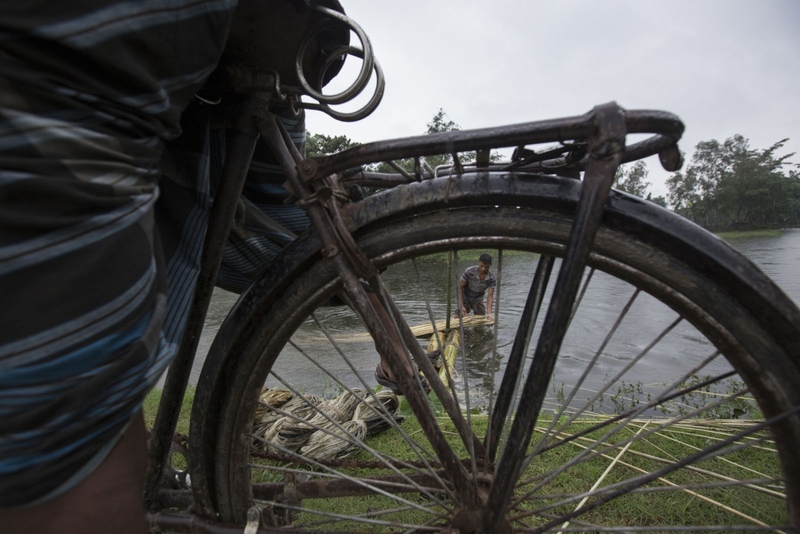 Bangladeshi men who lives very close to an enclave fish in a river swollen by rain. 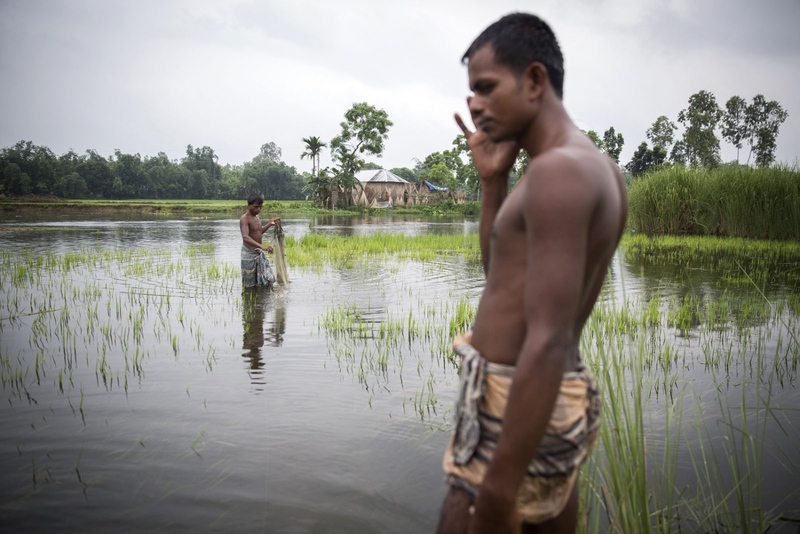 This part of Northern Bangladesh is very poor with most relying on fishing and agriculture to survive. Yet these man and their family will have electricity and be able to receive such things as basic health care and fertilizer subsidies. Those living in the enclaves will receive none of this. 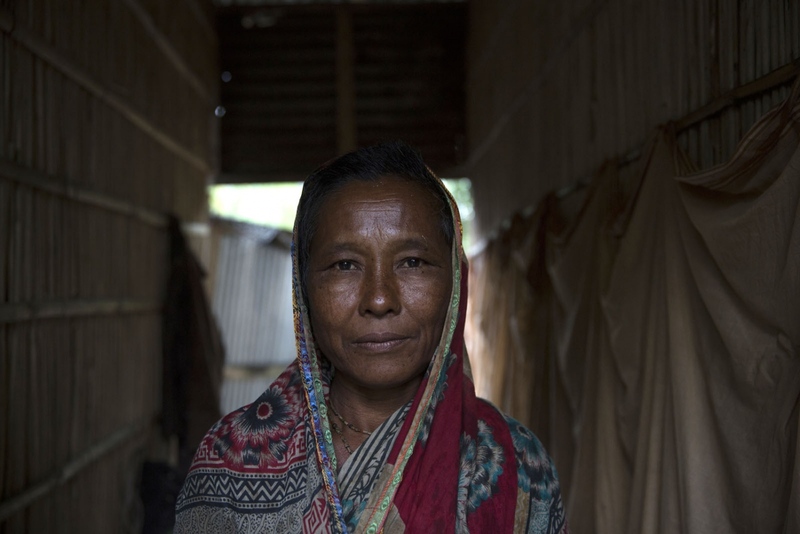 A lady from Ponchoki Bhajini village located inside the enclave of Dhoholakhagrabari. In a few months she will leave for India to start a new life as an Indian citizen. A street seen in a one street village that is surrounded by enclaves. For residents of the enclaves in this area this town is where they come to buy basic necessities. In theory until the enclaves were disbanded they were illegally crossing an international border, leaving Indian territory for Bangladesh. 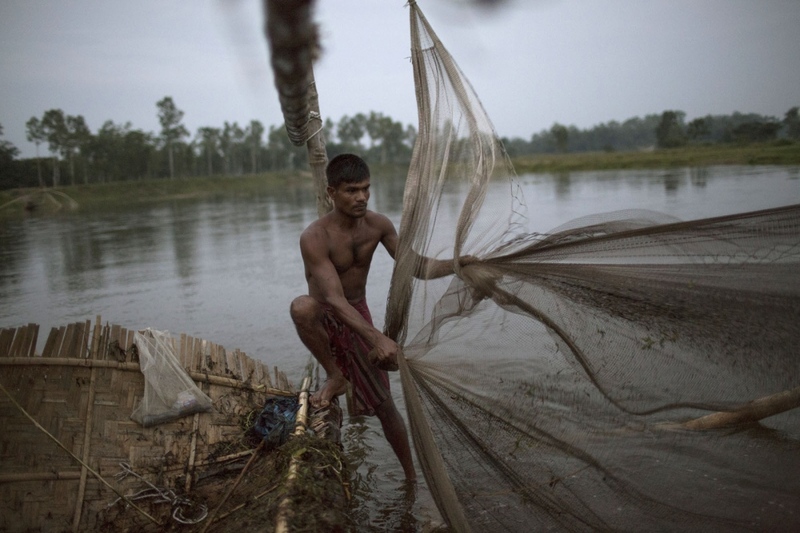 A Bangladeshi man fishes at dusk using his large bamboo fish trap. 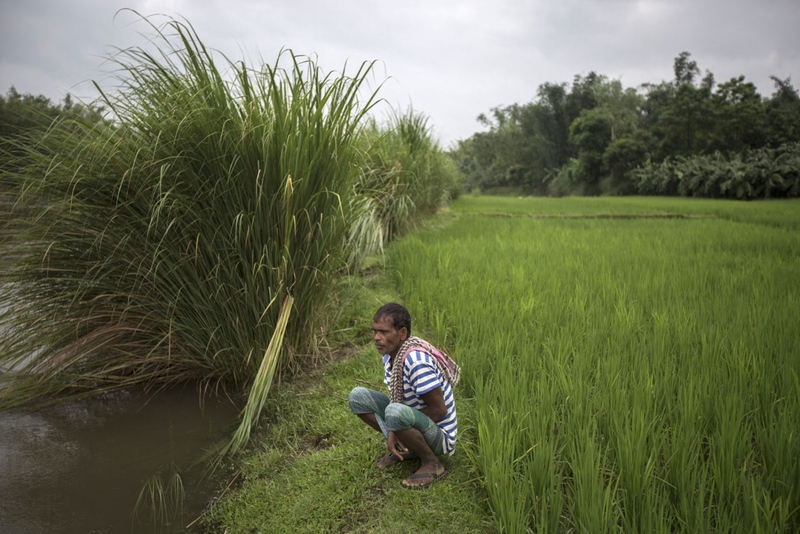 This river exists just outside the enclaves and as its in Bangladesh territory, enclave dwellers are forbidden to fish here otherwise angering the local fishermen. 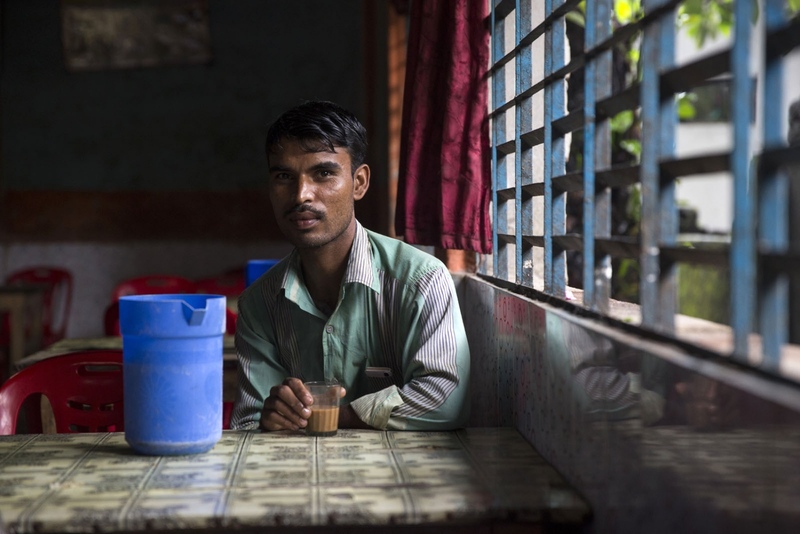 A Bangladeshi man has tea in a restaurant in town of Debiganj. 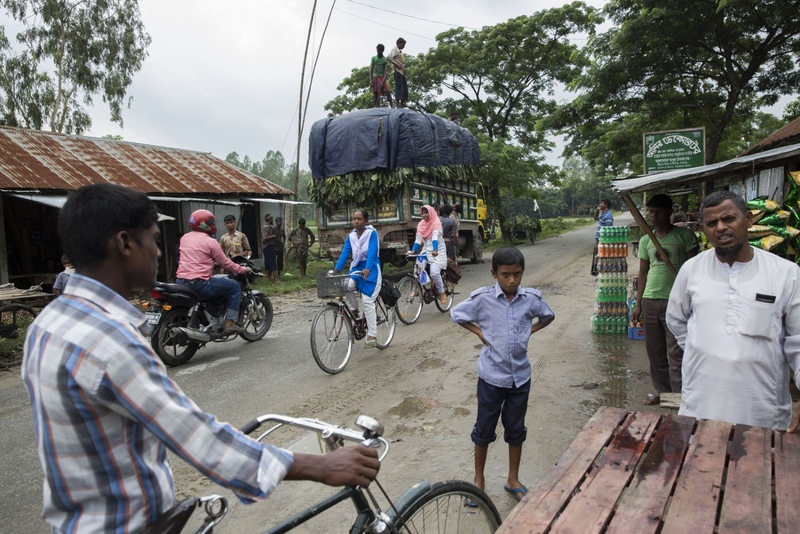 Out of the 979 enclave dwellers that decided to leave for India the district of Debiganj has 406 of them being surrounded by large enclaves. Sisters Lobar Rani Bormoni, 11, (left) and Shapla Rani Bormoni, 12, stand in a paddy field just outside their village of Ponchoki Bhajini located inside the enclave of Dhoholakhagrabari. Out of the 22 families in their village on 2 families will remain in Bangladesh, the rest including the girls, will move to India to start a new life. 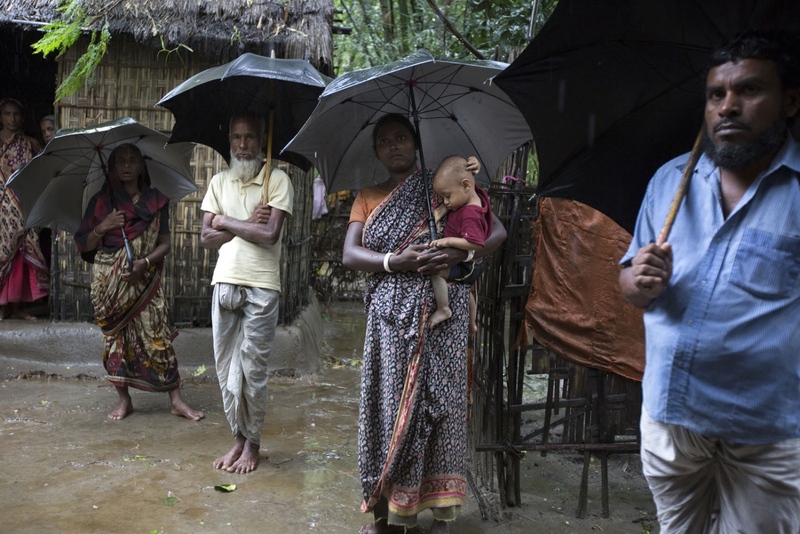 Residents of an enclave called Dayuti shelter from rain under umbrellas. 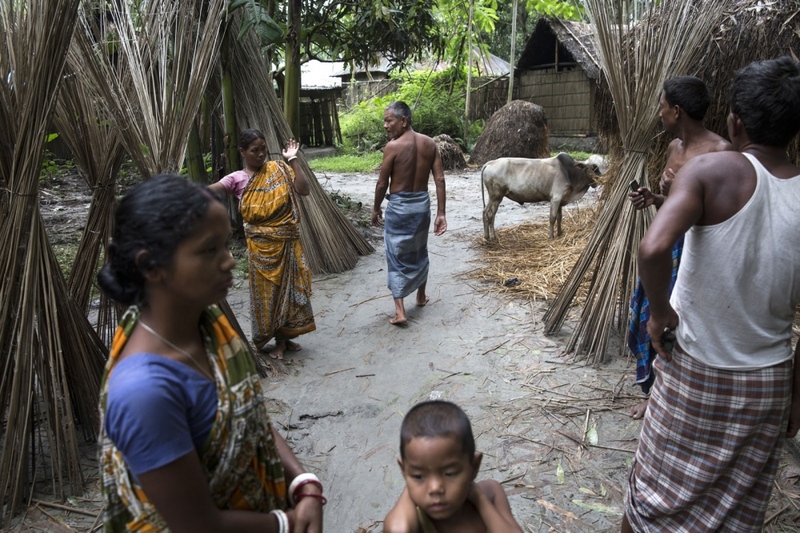 This relatively large enclave with a small population has fallen victim to powerful Bangladeshi families who have moved in to the enclave to grow eucalyptus evicting any local residents in their way. 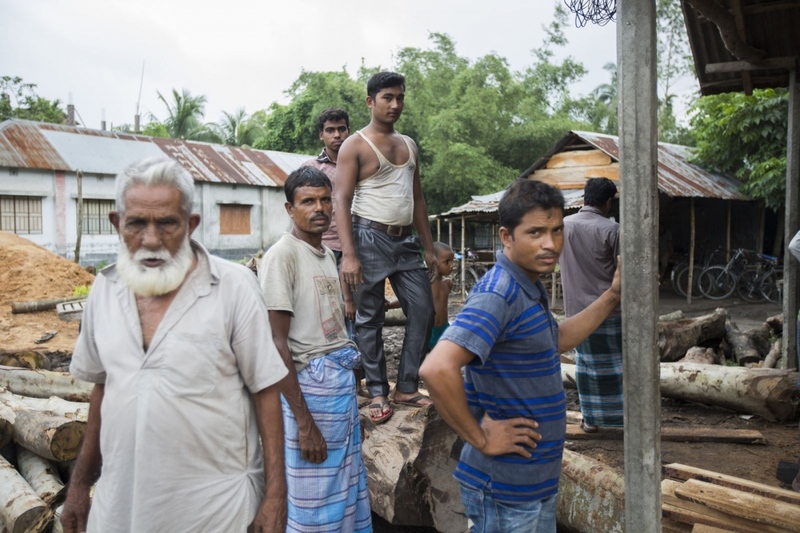 Because the Bangladeshi police have no jurisdiction in the enclaves the locals are powerless. A Bangladeshi man who lives very close to an enclave squats next to a river in the early morning. A Bangladeshi man sits in a shop in the market of a small town that sits between enclaves. There is very little distinction between land inside and outside an enclave but all the locals know know exactly where the boundaries lie. 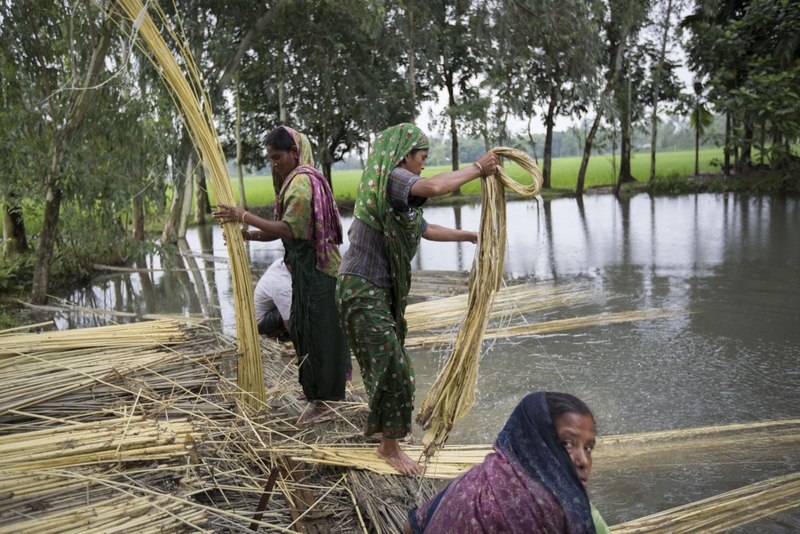 Inside an enclave, or chitmahal, villagers prepare jute that has been submerged in this pond for weeks. For the many inhabitants of the enclaves, jute is where most of their income comes from and also what they use to build their houses. 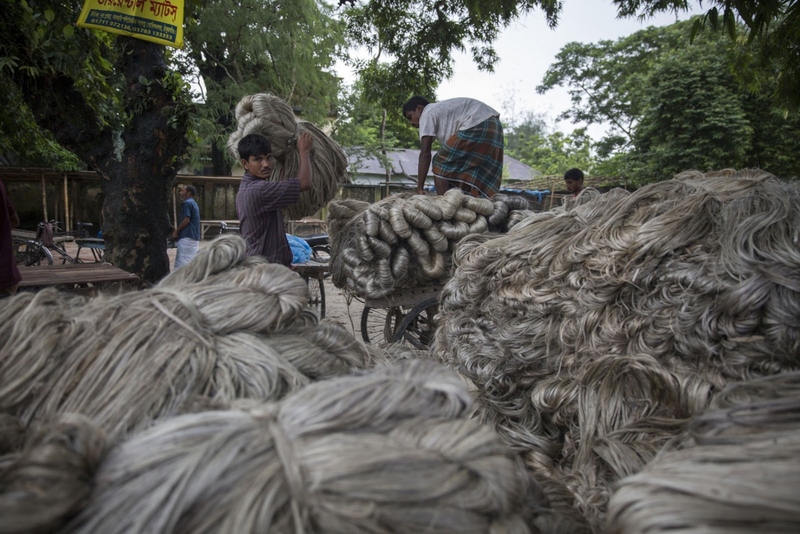 Jute is also known as the Golden Thread of Bangladesh is one of the largest industries in the country. Rupsana Begum, 7, (pink and white dress) and Monalisa Akter, 7, (orange dress) are from an enclave but were able to come and study at Sher-e-Bangla Government school as a result of their parents managing to acquire fake documents and pay money. 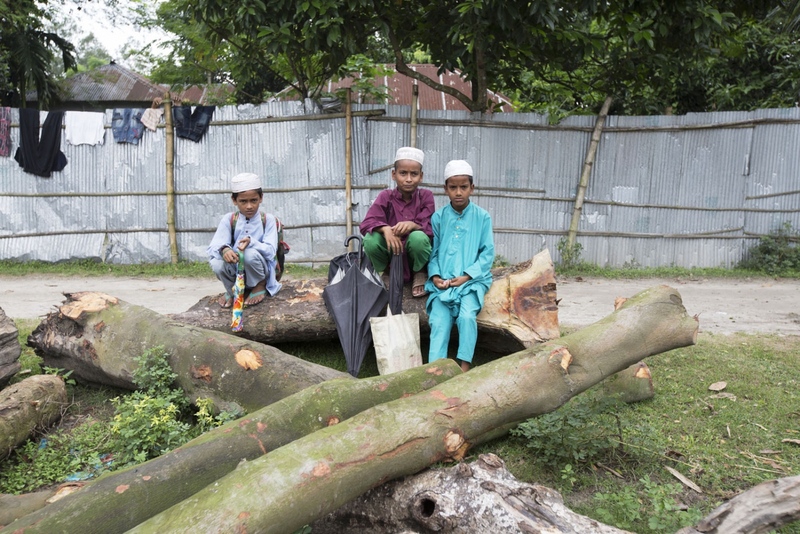 Local Muslim boys take a break between school on the logs of a saw mill in Debiganj town. 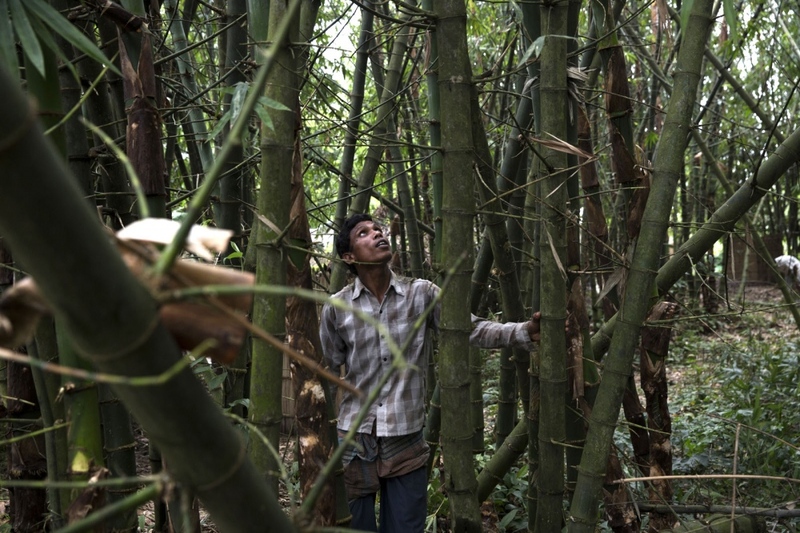 A man living in Ponchoki Bhajini village located inside the enclave of Dhoholakhagrabari inspects bamboo that they will cut down to celebrate a Hindu religious ceremony (durga) next month. All of the inhabitants of this village are Hindu and as a result 20 out of the 22 households will move to India in a few months. 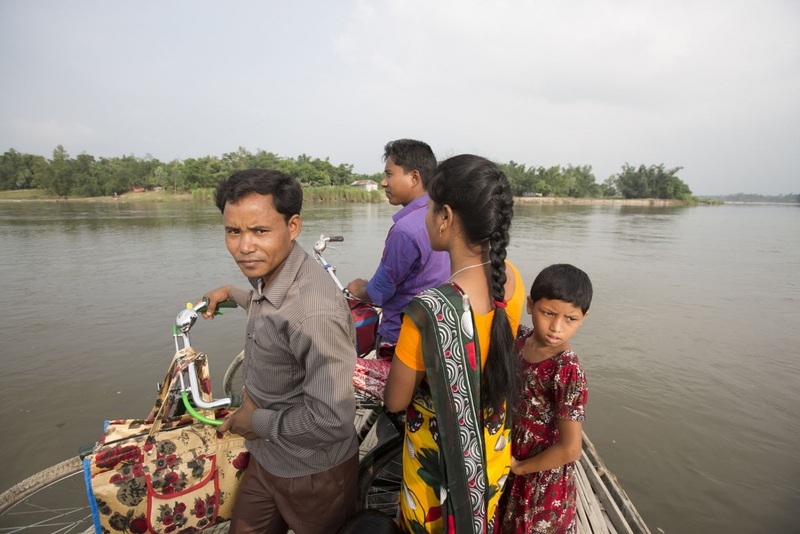 A boat is used for locals wanting to cross the Teesta River where enclaves dots both sides of its banks. Even for the land outside the enclaves this region is very underdeveloped. A village scene in Ponchoki Bhajini village located inside the enclave of Dhoholakhagrabari. All of the inhabitants of this village are Hindu and as a result 20 out of the 22 households will move to India in a few months. 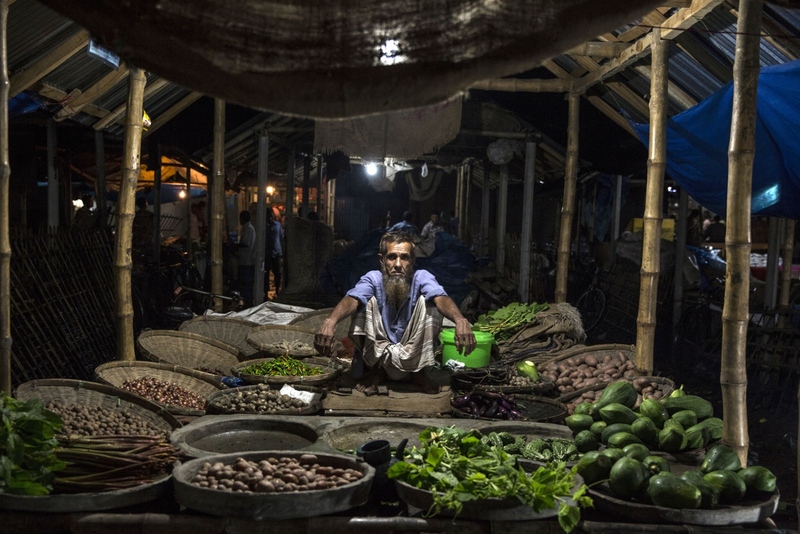 The large market of Debiganj town stays open well in to the night when locals from all over the countryside, inside and out of the enclaves, come to buy essentials. For thousands of enclave dwellers this is the nearest market for them.